Tooth decay is a serious health problem and it is often necessary to repair cavities. Today they often use a composite filling material made of acrylate compounds, as it resembles the colour of the teeth and is reasonably strong so it can handle the rigors of the powerful chewing movements. 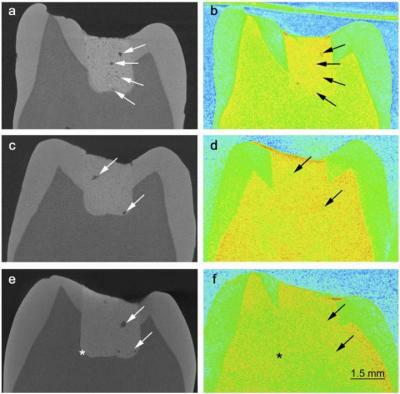 But composite filling materials have some disadvantages and now researchers are working on an interdisciplinary collaboration between physicists and dentists to develop a material comprised of glass ionomer cement. The results are published in the scientific journal, Scientific Reports. On the left are X-rays of teeth with fillings of glass ionomer cement. The images show how porous the cement is. On the right are images of the same teeth using neutron scattering. Here you can see if the pores are filled with liquid. Credit: (Credit: Benetti, A.R.et al., DOI:10.1038/srep08972 (2015). Amalgam, also called silver amalgam filling, is a reasonably strong material, but the disadvantage of silver amalgam is that they contain mercury, which can poison the environment. So they have mostly moved away from silver amalgam. Today, composites are usually used, but one of the drawbacks of many composites is that the fillings need to be replaced more frequently in patients that have a tendency to get many cavities. Another drawback is that composite materials require the use of an adhesive to bond the filling to the tooth and this makes the filling process more vulnerable. An interdisciplinary team of researchers decided therefore to develop a new alternative mercury-free material. The choice fell on glass ionomer cement. “Glass ionomer cement has the advantage that it does not need an intermediate layer of adhesive to bond to the tooth and it also has the interesting property in that it releases fluoride, which of course help to prevent cavities (caries). The material also has good biological properties, while it is almost as strong. Our research therefore focuses on understanding the connection between the microstructure of the material and its strength in order to improve its properties,” explains Ana Benetti, dentist and researcher at the Odontological Institute at the University of Copenhagen. Glass ionomer cement also has the property that when pulverised, it can be mixed with a liquid by hand without the use of special equipment and the material does not need to be illuminated with a lamp to harden (this is necessary for composite materials). This is a great advantage in remote areas without electricity like in Africa, China or South America. The researchers studied two kinds of glass ionomer cement. The cement itself is the same, but a mix of acids was blended into one them. They used two different kinds of liquids to mix the cement powder up, either ordinary water or water mixed with an acidic mixture. The question now was whether it was best to mix the acid up with the cement powder or with the water? They now carried out a series of experiments where they not only studied the cement, but also studied them as fillings inserted into teeth, i.e. teeth that had been pulled out and were no longer sitting in anyone’s mouth. “First, we took X-rays of the teeth with the cement fillings. They show the structure of the material. Glass ionomer cement is porous and you can get an accurate image in 3D, which shows the microstructure,” explains Heloisa Bordallo, associate professor and materials researcher at the Niels Bohr Institute at the University of Copenhagen. Heloisa Bordallo explains that it is ok for the material to be porous, but it is not ok for there to be liquid in the pores as it can make it easier for the fillings to break. So the next thing they did was take pictures with neutron scattering. Neutrons are good at showing where there are hydrogen atoms, which are found in all liquids. Both the X-ray and neutron experiments were carried out at the Helmholtz-Zentrum facilities in Berlin in collaboration with Markus Strobl, a materials researcher at the European Spallation Source, ESS and affiliated professor at the Niels Bohr Institute at the University of Copenhagen. By comparing the X-rays with the neutron images, they could now see whether the pores were dry or filled with liquid. It is not just the number of pores that determine the strength of a material. The strength or weakness lies in how the liquid moves around or attaches to the material itself. So the researchers repeated the experiments at research facilities in England and France over the course of many days in order to follow the chemical reactions that took place during the hardening. “Experiments showed that the combination where the acid is mixed up in the cement, so you only have to add water to the cement powder is the weakest material. You get the strongest material by having cement powder mixed with water that has had acid added to it. So it is better to have the acid in the water – it helps to bind the liquid faster and stronger to the cement and there is less water in the pores,” explains Heloisa Bordallo. There is still too much loose liquid in the pores, so now the research is continuing with new mixtures where they will try adding natural minerals to the cement.